Make your trip to Hobart memorable by staying in one of its premier apartments in the city. Unbeatable location with restaurants, the Waterfront, Hobart Museum, City Hall and the famous Salamanca Market only a short stroll away. Suitable for executives and families that don't want the hassle of driving, most local attractions as well as the CBD are only two blocks walk away. With luxury furnishings, fully equipped gourmet kitchen, 2 King bedrooms, and large living area equipped with Roku3 Streaming TV and Media Player to amuse adults and children alike, this Apartment allows you to experience the best of Hobart in comfort and style. Two sofa beds available at extra cost for the extended family giving a maximum occupancy of six people. Full laundry facilities and everything you could possibly need is provided for you at this unique and well presented apartment. A second toilet makes sharing easier, and with two living areas it provides flexible entertaining options. The main bathroom is shower only, and also has the washing machine and dryer hidden away for longer stays. Toiletries and tea/coffee are provided for you, the apartment has all the luxury of a hotel where you are the only guests. You also have the option of cooking up a storm with Tasmania's famous local seafood. Get the freshest catch from the waterfront daily. The dining room has an eight person dining suite making entertaining a pleasure and there are two separate lounge areas both with wall mounted flat screen TV's. The apartment is extremely family friendly with the separate living areas and a full size kitchen. 3 night minimum stay applies. Corporate rates available for longer stays. 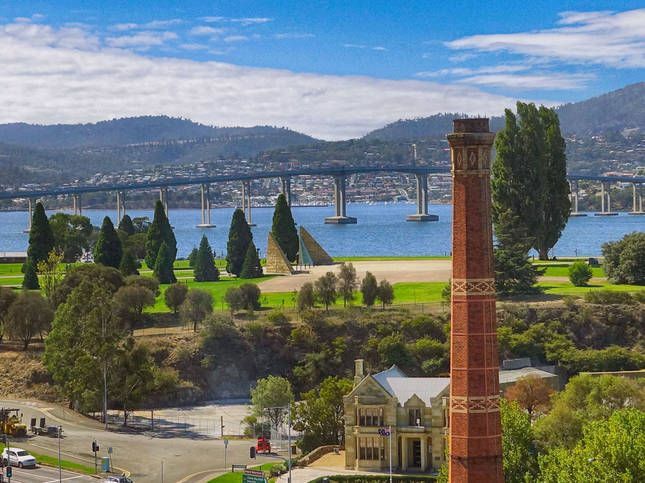 Be a part of the rich history of Tasmania by staying in a historic site, the Hobart Gasworks. - Apple TV and Chrome Cast equipped TV in Living Room. - Unlimited, exclusive and free Wi-Fi and Wired Internet powered by an NBN FTTP connection. We loved our stay! It was a beautiful, roomy & clean apartment. Great location! Beds were comfortable! Would love to stay again if we are in Hobart. Thanks for offering such an amazing property! Great apartment only minutes to CBD and Docks area. Super clean and warm. The beds were super comfy. Recommend to stay. Only drawback was the steep stairs to the apartment and icy Hobart conditions made them very slippery. -Reply: Thank you for your comment. We have since taken note solved the issue by applying anti-slippery material on the stairs. We really enjoyed our stay at the Gasworks Apartment. The location is perfect, close to everything. The apartment is quite large and would comfortably suit two couples. The apartment has been fitted out & furnished beautifully, everything has been thought of making our stay enjoyable & carefree. Also, the service when you collect / return keys was friendly and hassle free. Great spot. Lovely large apartment. Loved the location and facilities. Comfortable and clean. Clean, spacious and well equipped apartment in a perfect location close to the docks, restaurants and bars. We stayed 6 nights and loved the property, great to have the bottle shop downstairs, parking was readily available using the permit and there was plenty of crockery, cutlery, glassware and cooking utensils. Beds were comfortable and we appreciated the washer and dryer, everything you need in a clean and very comfortable apartment. Thank you Toni for your kind review. We would also like to thank you for taking so much effort in looking after our apartment. We would very much love to serve you again. Lovely apartment in wonderful location. Across the street from Zero Davey you at next to a stop on the local Hop On Hop Off bus.We just left our car parked in parking lot, only using it to drive up to Mt. Wellington. Excellent host with outstanding communication. Apartment is fitted out nicely with a washer AND dryer....something very useful to a family! Apartment is on top of the liquor store with outside steps....could be problematic for people fearing heights or vision impaired. Yes, there is street noise, but nothing inappropriate to being in the CBD. Otherwise it was perfect for my family of 5. Next time we return to Hobart I will look to stay here. Lovely apartment that is well located for the harbour area as well as the city and surrounding attractions. The apartment is spotlessly clean and the beds are firm but comfortable. Shung is a pleasure to deal with and could not have been more helpful. Everything you need is supplied in the apartment. We really enjoyed our 3 nights in the apartment. Great value for money.